The breeze remained NE through the weekend, light-moderate for good varied racing, swinging enough for some tactical challenges and biased start-lines. With some bursts of bright sunshine, it was a great final event. The two reaches gave good competition, with big gains (and losses) riding gusts in the lighter top-end breeze, and by the end of racing on Sunday an exciting ride on the downwind reach as the breeze kicked up. For Race 2, Alastair and Stuart Ede mis-read the line bias, and their port-end start was disastrously behind the starboard starters, with Gareth and John Terry well way, for a good lead held to the finish. Alastair's bad start took him out on starboard to the right, where he picked up good pressure to gain again (photo below) until Alex caught him gradually around the final lap of three to take the trhird place. By Race 3 the wind had swung further east, removing the line bias, with a tight fleet start on starboard. The freshening breeze allowed Alex, Gareth and John to trapeze consistently upwind with advantage, and they moved out ahead. With the breeze swung right, the usual tactic each lap was for one long starboard leg and a final long port leg to the mark (risking blanketing from the Sprints reaching down the next leg.) With the boats in an upwind procession, in the building breeze George Evans' ability to point high while keeping boat speed gave him gains on every beat, and he captured third from John, with Alex recording his second win, ahead of Gareth . On Sunday, Alex Montgomery, having scored two wins on Saturday had to depart for work comitments. The same NE breeze, due to build gradually during the day and still veering unpredictably suited the same trapezoid course. In the light breeze for Race 4 Alastair defended the starboard pin end successfully, and chased Gareth (again starting lower down the line at speed) to the top mark, rounding close. With downwind gains, they built a good lead, with Gareth on the run consistently going well out right on starboard, avoiding the Sprints, and driving in late on port, not losing from the wider dog-leg. John Terry came up to challenge, but finding himself in the lee of Alastair and several Sprints tacked off right, only to lose the breeze in a hole and stick at third. Syd Gage came up fast to take the fourth from George. As forecast, the breeze was up for Race 5 giving the light trapezing helms an upwind advantage. A tight fleet contested the starboard-end start (photo below) until Gareth chased by John stretched out. Behind, George's ability to keep upwind speed pointing higher than anyone else moved him up the fleet, staying just ahead of Stuart and Alastair downwind. 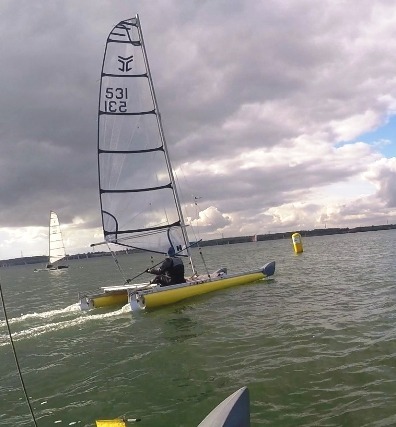 For the Sunday racing, Chris had changed to the sail John Peperell had repaired after Chris plunged straight through it in his early capsizing days, and this gave a clear gain in both upwind and downwind speed. He harried the leading boats, passing Alastair on lap 3, and then on the final short beat to the line snatched third from George by inches. 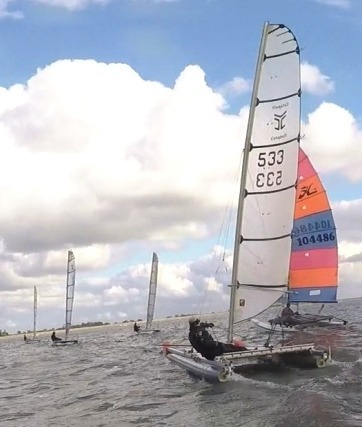 ( Below: The race 5 start: Alastair, far right, protecting the starboard pin end, has successfully forced John to duck below him, but also is hailing a warning to a barging Hobie (out of shot in the on the right) Meanwhile Gareth is making a characteristic start further down the line at speed. Photo Syd Gage. Stuart from a good start chased Gareth and John but they again moved out on trapeze in the freshening wind. George enjoying the bursts of stronger breeze came up, with Stuart and Alastair hauling some distance back downwind on lap 3, all staying close. Stuart defended fourth efficiently, and behind in the final fourth lap, Syd made big gains keeping speed on the reaches and downwind, to take Alastair on the run to pull into third. Syd survived a deep nose-dive as the wind piped up on the final short reach, only to let Alastair through as they finally tacked to the line. The win confirmed Gareth's a firm grip on the 2016 TT Leaderboard and he wins the 2016 Jon Montgomery Trophy comfortably. John Terry's good results after missing events let him just overtake George Evans for the TT second place.